This is an example of kids projects that are good for boys as well as girls. Just pick out the more macho bead styles and colors and let the boys have fun, too! Waxed linen cord or Leather cord. When I taught this, we had been given a bunch of 3-yard pieces of this leather cord, and each student who wanted to use leather got the whole 3 yards to play with. I wanted to introduce the idea of space between beaded elements, because the absence of beads is really a part of the design here. We were making these necklaces big enough to slip on over the head, so no clasps were necessary. Making knots was an important part of the lesson, both the single overhand knots to hold the beads in place on the cord and square knots to fasten the two ends of the necklace together. Because we had a pretty mixed lot of beads for this class, I had sorted them into color groups to make it easier to find things that would look good together. The girls loved pawing through the beads to select goodies to use in their necklaces. 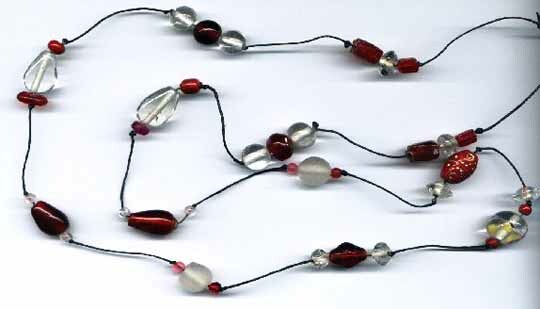 I encouraged them to start in the center of their cord, finding a nice center bead or bead group, and then working out toward both ends at once, to keep things relatively balanced. when the necklace was a nice length for them, they tied a square knot and trimmed the ends of the cord to about a half inch. At the end of the class, we looked at samples of the next project, spiral rope bracelets.